Slideshow: With 4 outboard Mercury Racing 400R engines, the 41' AMG Carbon Edition Cigarette boat is capable of sprinting to a top speed of 83 mph while carrying 8 passengers. Mercedes-AMG is known for building some of the most powerful vehicles on the market. This time, the team at Affalterbach and that from Cigarette Racing in Miami have joined forces to build a 1,600 horsepower boat that tops at 83 mph. 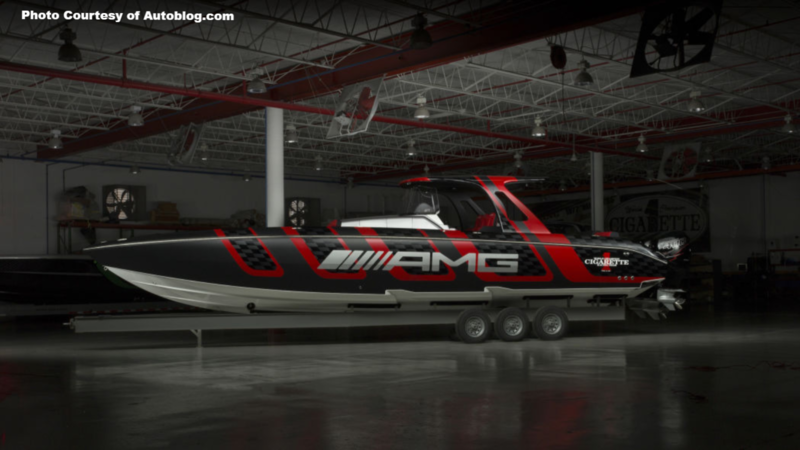 It's almost made out of pure carbon fiber and is dubbed the 41' AMG Carbon Edition cigarette boat. This is the eleventh edition and it draws its inspiration from one of the latest 4-door Mercedes-AMG GT models. Both teams based the design philosophy for the speedboat on the all new 630 hp AMG GT 63 S - a 4-door coupe that gets from 0-60 mph in a little over 3 seconds. 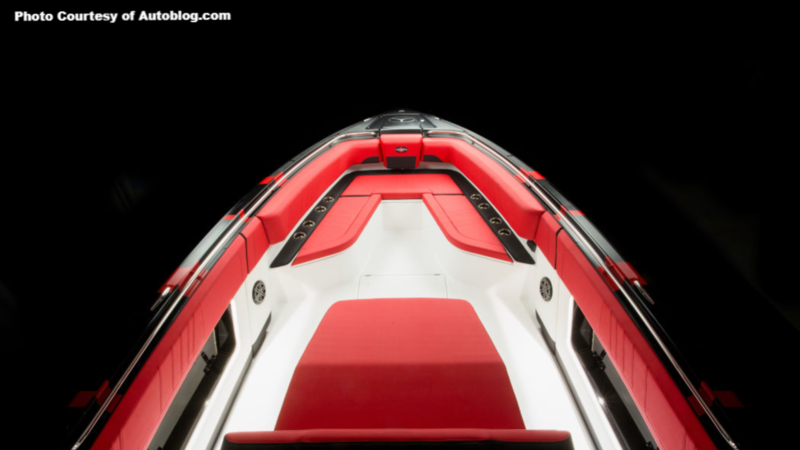 It's quicker than AMG's own top-of-the-range $160,000 GT-R. Just like the coupe, the 41-foot glossy red and black speedboat accommodates a good number of people without compromising performance. 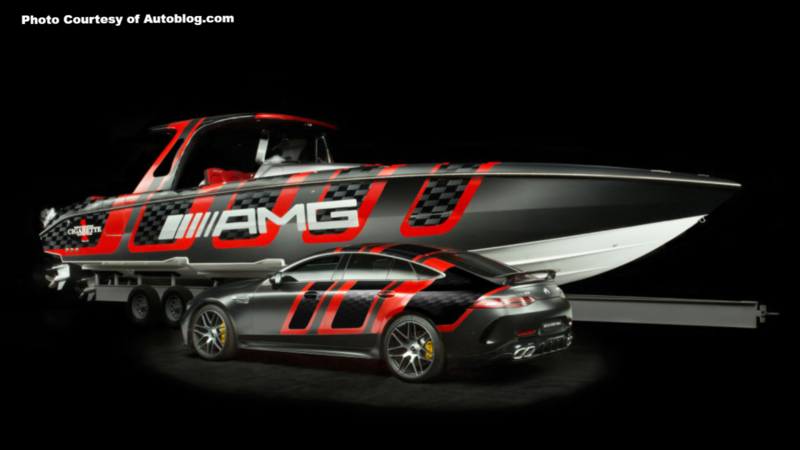 >>Join the conversation about this AMG Cigarette racing boat right here in MBWorld forum. What do you get when you combine efforts between an American luxury super boat builder and a German luxury supercar automaker? 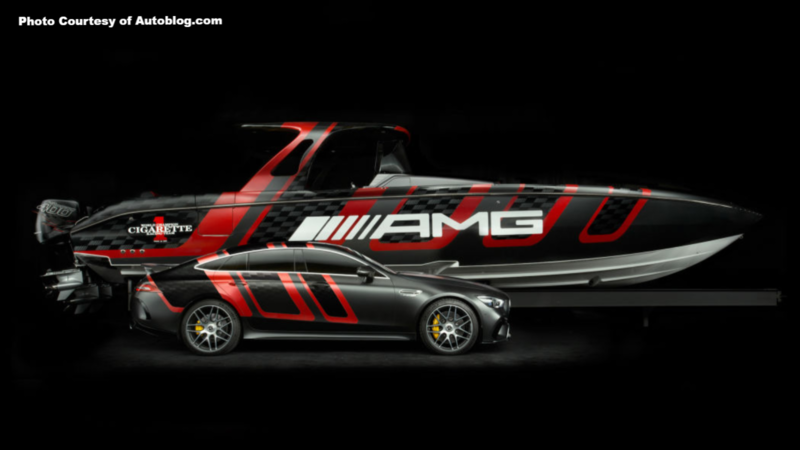 Cigarette Racing and Mercedes-AMG have been on a 12-year partnership that has yielded some of the best racing boats out there. Multiple cars have been used as an inspiration over the years, including the SLS, the Vision GT Concept, the GTS, and the G-Wagen. Both brands have worked tirelessly to continuously embody their brand images through finely-crafted boats. Thanks to a carbon-fiber roof structure, hull, rudder, and deck; the AMG Carbon Edition manages to shed more than 500 pounds off its weight. The entire sandwich structure is rigid enough to provide enough safety when bouncing off the waves at 80 mph plus. The team at AMG managed to maintain the boat's flexibility and stability by lowering its center of gravity. This allows the helmsman to have full control and deliver safe landings. 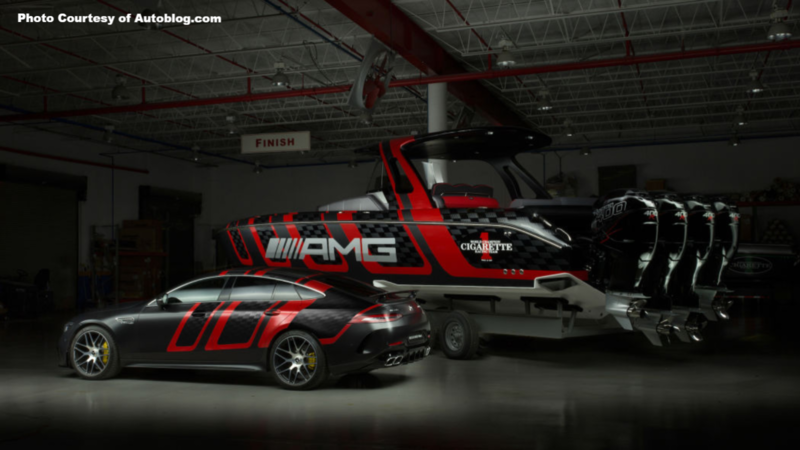 Like all other projects, AMG and Cigarette began the design process more than a year prior. There are about 16 concepts that move back and forth before getting approved. The lay-up of the hull begins about 8 months before, while the paint process takes more than 2 months. The upholstery pushes the project another full month because the seating is hand-stitched. The project has continuously pushed the builders out of their comfort zones as they try to deliver more luxury and performance. 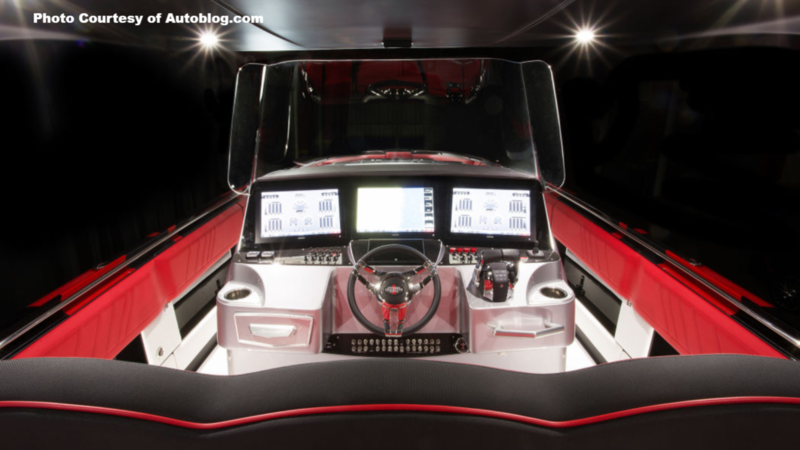 There are 4 outboard Mercury Racing 400R engines under the "hood" of the 41' AMG Carbon Edition Cigarette boat. These are responsible for delivering a whopping 1,600 hp that make the speedboat feel like a "Formula One on water". They are a true representation of AMG's passion for power and aesthetics. At maximum speed, the AMG Carbon Edition carries 8 people comfortably. The interior is built to mimic that of AMG's best sports cars with their brilliant mixture of Alcantara and carbon fiber. 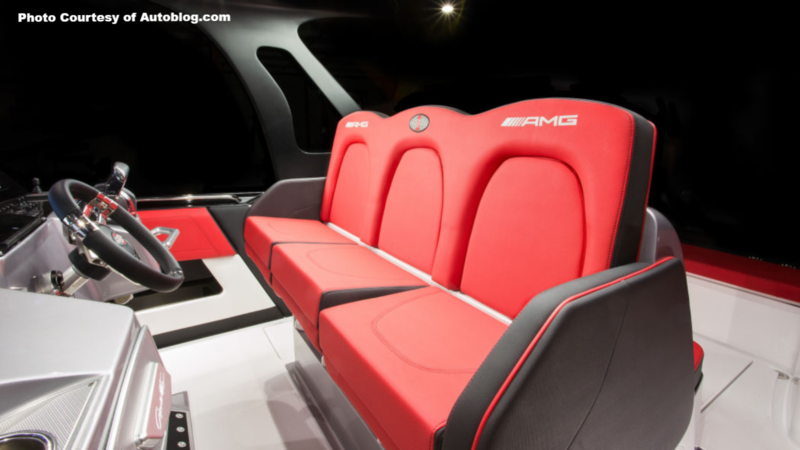 This ensures that passengers are comfortable and get to feel every element of luxury and power expected from an AMG. 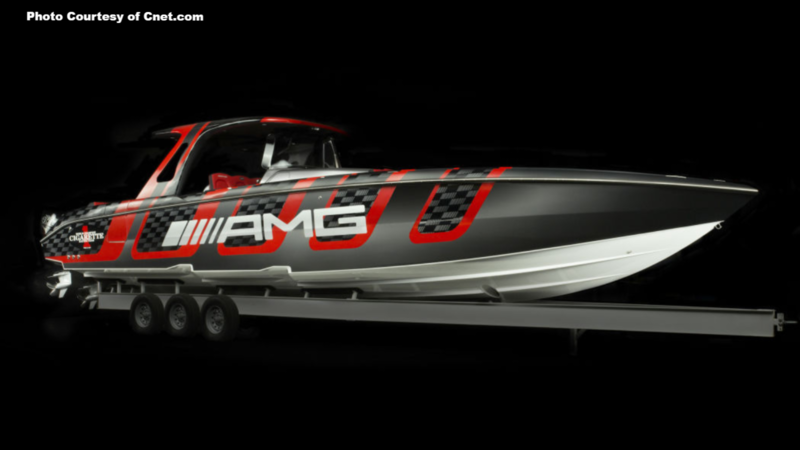 The 41' AMG Carbon Edition Cigarette boat is priced at $850,000. Some of the design cues carried over from the AMG include interior decorative speakers, ambient lighting, and broad LCD instrumentation screens. The hull features a unique color shade created solely for the 4-door AMG coupe. The upholstery is unique to the team at Cigarette. The fabric reflects up to 30% of absorbed heat without scorching seated passengers. All in all, the entire masterpiece is a unique blend of coddling comfort and competitive sportiness.